As Don Cheadle points out, if as many people cared about the horrific situation in Darfur as they care about voting for American Idol, we may be closer to resolving the situation. It’s a sad yet astute observation regarding the importance of our celebrity-obsessed culture that serves as the launching pad of responsibility for our fellow man that drove Cheadle, first acquainted with genocide while shooting Hotel Rwanda to co-write a book entitled Not On Our Watch which outlines the genocide in Sudan’s western region of Darfur that led to the more than 200,000 people killed and 2.5 million displaced over the past four years. In filmmaker Ted Braun’s documentary, co-producer and star Cheadle is just one of the film’s six individuals highlighted for their contributions in calling attention to and trying to do their part to stop the conflict. In addition, we meet dedicated waiter Adam Sterling who formerly avoided leaflet hording protestors on his college campus to eventually change his mind and help pass a law signed by Governor Schwarzenegger that would divest investments by California companies out of industries and exports important to Sudan. Secondly we are introduced to inspiring humanitarian Pablo Recalde who runs the World Food Program delivering nourishment to millions of individuals in treacherous areas overrun with Janjaweed militia-men along with a female rebel fighter Hejewa Adam who joined the resistance after losing her baby. 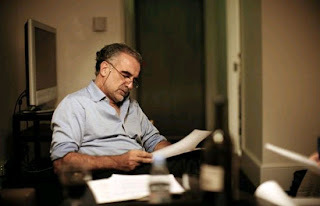 Perhaps most stirring is our acquaintance with the fight being led by Argentine International Criminal Court prosecutor Luis Moreno-Ocampo who is working on developing an air-tight evidence heavy case to arrest some of the guiltiest offenders of crimes against humanity at the court in The Hague, Netherlands. Braun’s film is at once both expectedly sad yet surprisingly moving—like An Inconvenient Truth, it’s a call to action and a worthwhile lesson on the roots of the situation and we’re shocked by the devastating fact that time and time again this type of horror occurs in countries around the globe since the incomprehensible atrocities of the Holocaust that should have served as a warning to never let it happen again. Yet again, it has and we’re educated as Variety’s John Anderson pointed out in his review that, “Braun makes it clear that Darfur embodies all the elements of current and future world tension: tribalism, religious conflict, global warming (drought was a factor in the war) and China, which gets 60% of all Sudanese oil.” Darfur Now, which was an official selection at the Toronto International Film Festival, has just been released in theatres with ticket sales benefitting the cause.